Died in Fribourg, 21 November, 1597. His father was the wealthy burgomaster, Jacob Canisius; his mother, Ægidia van Houweningen, died shortly after Peter's birth. In 1536 Peter was sent to Cologne, where he studied arts, civil law, and theology at the university; he spent a part of 1539 at the University of Louvain, and in 1540 received the degree of Master of Arts at Cologne. Nicolaus van Esche was his spiritual adviser, and he was on terms of friendship with such staunch Catholics as Georg of Skodborg (the expelled Archbishop of Lund), Johann Gropper (canon of the cathedral), Eberhard Billick (the Carmelite monk), Justus Lanspergius, and other Carthusian monks. Although his father desired him to marry a wealthy young woman, on 25 February, 1540 he pledged himself to celibacy. In 1543 he visited Peter Faber and, having made the "Spiritual Exercises" under his direction, was admitted into the Society of Jesus at Mainz, on 8 May. With the help of Leonhard Kessel and others, Canisius, labouring under great difficulties, founded at Cologne the first German house of the order; at the same time he preached in the city and vicinity, and debated and taught in the university. In 1546 he was admitted to the priesthood, and soon afterwards was sent by the clergy and university to obtain assistance from Emperor Charles V, the nuncio, and the clergy of Liège against the apostate Archbishop, Hermann von Wied, who had attempted to pervert the diocese. In 1547, as the theologian of Cardinal Otto Truchsess von Waldburg, Bishop of Augsburg, he participated in the general ecclesiastical council (which sat first at Trent and then at Bologna), and spoke twice in the congregation of the theologians. After this he spent several months under the direction of Ignatius in Rome. In 1548 he taught rhetoric at Messina, Sicily, preaching in Italian and Latin. At this time Duke William IV of Bavaria requested Paul III to send him some professors from the Society of Jesus for the University of Ingolstadt; Canisius was among those selected. On 7 September, 1549, he made his solemn profession as Jesuit at Rome, in the presence of the founder of the order. On his journey northward he received, at Bologna, the degree of doctor of theology. On 13 November, accompanied by Fathers Jaius and Salmeron, he reached Ingolstadt, where he taught theology, catechized, and preached. In 1550 he was elected rector of the university, and in 1552 was sent by Ignatius to the new college in Vienna; there he also taught theology in the university, preached at the Cathedral of St. Stephen, and at the court of Ferdinand I, and was confessor at the hospital and prison. During Lent, 1553 he visited many abandoned parishes in Lower Austria, preaching and administering the sacraments. The king's eldest son (later Maximilian II) had appointed to the office of court preacher, Phauser, a married priest, who preached the Lutheran doctrine. 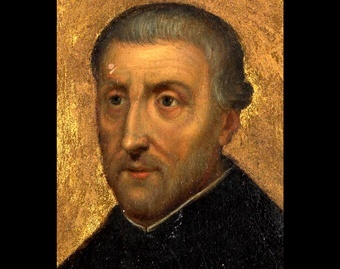 Canisius warned Ferdinand I, verbally and in writing, and opposed Phauser in public disputations. . After long negotiations and preparations he was able to open Jesuit colleges at Ingolstadt and Prague. In the same year Ignatius appointed him first provincial superior of Upper Germany (Swabia, Bavaria, Bohemia, Hungary, Lower and Upper Austria). During the winter of 1556-57 he acted as adviser to the King of the Romans at the Diet of Ratisbon and delivered many sermons in the cathedral. By the appointment of the Catholic princes and the order of the pope he took part in the religious discussions at Worms. As champion of the Catholics he repeatedly spoke in opposition to Melanchthon. The fact that the Protestants disagreed among themselves and were obliged to leave the field was due in a great measure to Canisius. He also preached in the cathedral of Worms. He spoke in keeping with the spirit of the age, explained the justification of man, Christian liberty, the proper way of interpreting the Scriptures, defended the worship of saints, the ceremonies of the Church, religious vows, indulgences. urged obedience to the Church authorities, confession, communion, fasting, and almsgiving; he censured the faults of the clergy, at times perhaps too sharply, as he felt that they were public and that he must avoid demanding reformation from the laity only. Against the influence of evil spirits he recommended the means of defence which had been in use in the Church during the first centuries—lively faith, prayer, ecclesiastical benedictions, and acts of penance. In the cathedral, his confessional and the altar at which he said Mass were surrounded by crowds, and alms were placed on the altar.In 1559 he opened a college in Munich; in 1562 he appeared at Trent as papal theologian. The council was discussing the question whether communion should be administered under both forms to those of the laity who asked for it. Lainez, the general of the Society of Jesus, opposed it unconditionally. Canisius held that the cup might be administered to the Bohemians and to some Catholics whose faith was not very firm. After one month he departed from Trent, but he continued to support the work of the Fathers by urging the bishops to appear at the council, by giving expert opinion regarding the Index and other matters, by reports on the state of public opinion, and on newly-published books. In the spring of 1563 he rendered a specially important service to the Church; the emperor had come to Innsbruck (near Trent), and had summoned thither several scholars, including Canisius, as advisers. Some of these men fomented the displeasure of the emperor with the pope and the cardinals who presided over the council. For months Canisius strove to reconcile him with the Curia. He has been blamed unjustly for communicating to his general and to the pope's representatives some of Ferdinand's plans, which otherwise might have ended contrary to the intention of all concerned in the dissolution of the council and in a new national apostasy. The emperor finally granted all the pope's demands and the council was able to proceed and to end peacefully. All Rome praised Canisius, but soon after he lost favour with Ferdinand and was denounced as disloyal; at this time he also changed his views regarding the giving of the cup to the laity (in which the emperor saw a means of relieving all his difficulties), saying that such a concession would only tend to confuse faithful Catholics and to encourage the disobedience of the recalcitrant. In 1562 the College of Innsbruck was opened by Canisius, and at that time he acted as confessor to the "Queen" Magdalena (declared Venerable in 1906 by Pius X; daughter of Ferdinand I, who lived with her four sisters at Innsbruck), and as spiritual adviser to her sisters. At their request he sent them a confessor from the society, and, when Magdalena presided over the convent, which she had founded at Hall, he sent her complete directions for attaining Christian perfection. In 1563 he preached at many monasteries in Swabia; in 1564 he sent the first missionaries to Lower Bavaria, and recommended the provincial synod of Salzburg not to allow the cup to the laity, as it had authority to do; his advice, however, was not accepted. In this year Canisius opened a college at Dillingen and assumed, in the name of the order, the administration of the university which had been founded there by Cardinal Truchsess. In 1565 he took part in the Second General Congregation of the order in Rome. While in Rome he visited Philip, son of the Protestant philologist Joachim Camerarius, at that time a prisoner of the Inquisition, and instructed and consoled him. Pius IV sent him as his secret nuncio to deliver the decrees of the Council of Trent to Germany; the pope also commissioned him to urge their enforcement, to ask the Catholic princes to defend the Church at the coming diet, and to negotiate for the founding of colleges and seminaries. Canisius negotiated more or less successfully with the Electors of Mainz and Trier, with the bishops of Augsburg, Würzburg, Osnabrück, Münster, and Paderborn, with the Duke of Jülich-Cleves-Berg, and with the City and University of Cologne; he also visited Nimwegen, preaching there and at other places; his mission, however, was interrupted by the death of the pope. Pius V desired its continuation, but Canisius requested to be relieved; he said that it aroused suspicions of espionage, of arrogance, and of interference in politics (for a detailed account of his mission see "Stimmen aus Maria-Laach", LXXI, 58, 164, 301). In 1581 he founded a sodality of the Blessed Virgin among the citizens and, soon afterwards, sodalities for women and students; in 1582 schools were opened, and he preached in the parish church and in other places until 1589.